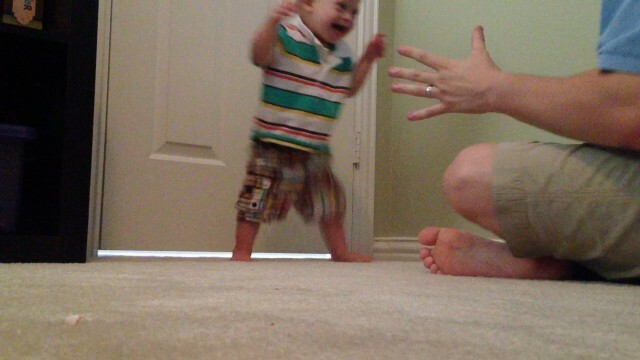 You are here: Home / Resources / Milestone Alert: Noah Takes His First Steps! I have realized walking is definitely a journey and not a firm milestone that all of a sudden happens one day. We are not going to claim Noah as a walker on this day, he is actually has a little ways to go before making that declaration. However, so many activities have led to this awesome moment and we will celebrate it. We have been working on his core strength practically since he was born which is essential in all milestones. He has gone from sitting to pulling up to stand, to crawling and then creeping. He has been strengthening his legs as well. He have also been working on the treadmill helping him learn the pattern of walking. Walking? Nah, I’d rather do the splits instead…. Noah has been going through the stages of pre-walking as well. He will walk while holding two hands and will cruise along furniture. He is also a big fan of push toys. Today Noah is doing what I would call controlled falling and Patricia Winders refers to as lunging steps. At this time he is not quite strong enough to walk while holding one hand only, he is also not standing up on his own without support. 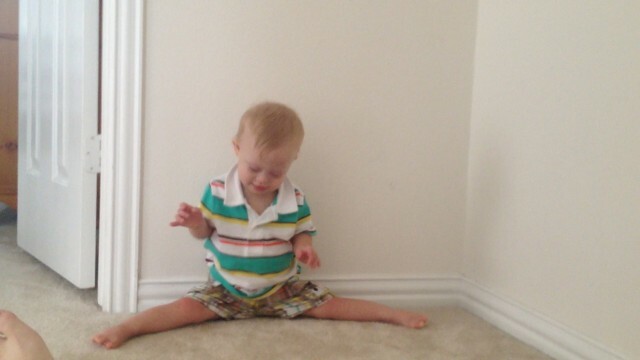 We have talked about how Noah does not like to bend his legs and that is one reason he is not able to stand on his own in the middle of a room. I don’t see Noah really walking on his own until he is able to do this important step. He will stand without support once he is placed in that position, but the kid fall right on over when he tries to get to that position on his own. You can see that Noah does not have a lot of balance and he is basically falling forward while taking steps at the same time and lunging towards his destination. He gets pretty excited and his head movements are not helping him either. A good way to practice lunging steps is to find the right motivator. Noah is a mover and he is definitely motivated to get from one place to another especially if that location contains an awesome toy or in this case an awesome parent. Finding the right motivator for your child will help encourage them to move from one place to the other. Putting a motivator on a couch and having your child lunge towards that or having them lunge between parents help practice this skill. It helps them get used to the feeling of going forward and eventually catching themselves with their feet so that they will continue on towards walking. As you can tell form the joyous screaming by my husband in today’s video, we are super proud of our little boy! love the video! It reminds me of when our own itty-bitty took his first steps. Luke took lunging steps at just shy of three and became a steady walker after using a posterior walker at three and a half. 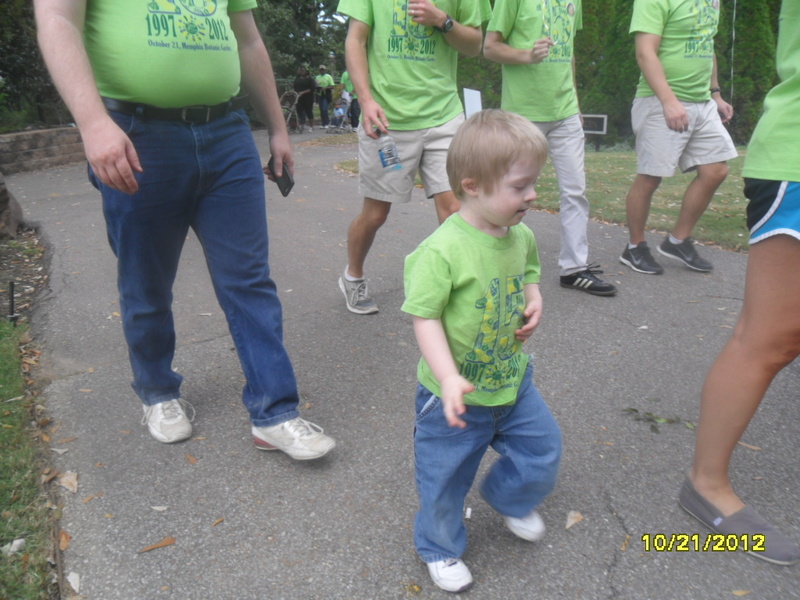 He walked by himself at last years “step up for down syndrome” walk. We were so proud! can say with firm knowledge… every child I knew with Downs did walk and did become potty trained (something my son was not able to achieve despite the bowel programs etc). So don’t ivve up! Just wanted to jump in and say our little boy, Way, did not smile until he was 6 months and it took him longer to give truly social smiles. Our eye dr. Talked to us about him not truly being able to focus due to some nystagmus (sp?) So, your little girl may have some of that, or not, but Way smiles up a storm now! It’s hard to wait for those smiles, but they will come and are truly worth the wait! Hope that eases some concerns a tad! I love how much you encourage Noah! It almost brings tears to my eyes! Question: Are you and your wife Christians or practicing Jews? So it means just Christians or practicing Jews can encourage…. I guess we all are first Human being. Arn’t we? Indeed we are human being above and beyond our personal believes. Keep you minds wide open 🙂 Thank you Noha’s parents for this site, it is so inspiring. My little girl with DS took her first steps yesterday at 15 and half months.I am over the moon.Still its long way to be an independant walker.Still she can not stand in the middle of a room.Huge thank you to noah’s dad.we live in a country without proper therapy services.Thank you for your post about tredmill. it was a big help for her. Wow…!! That is so awesome! Thanks so much for sharing that great milestone with us! Does your little girl have any brothers or sisters? She does not have a sibling. She is our first.it is scary to think about a day without us….but we are determined to do our best until then. Again thank you so much for taking your time to maintain a web site like this. I am sure you are reaching and inspiring parents like us from every corner of the world. My son also has DS and didn’t cuthis first tooth until he was 16 months. He’s now 26 months and has just cut his 12th tooth so we still have a ways to go! It will come eventually, just give it time! LOVE the video! GO Noah! For some reason, she always wanted our kitchen drawers (and doors) shut. So, we would intentionally leave them pulled out so that she would pull herself up to close them. One day, she turned toward me and took a step! It was GAME ON after that! I can bet that cutey has everyone wrapped around her little finger. 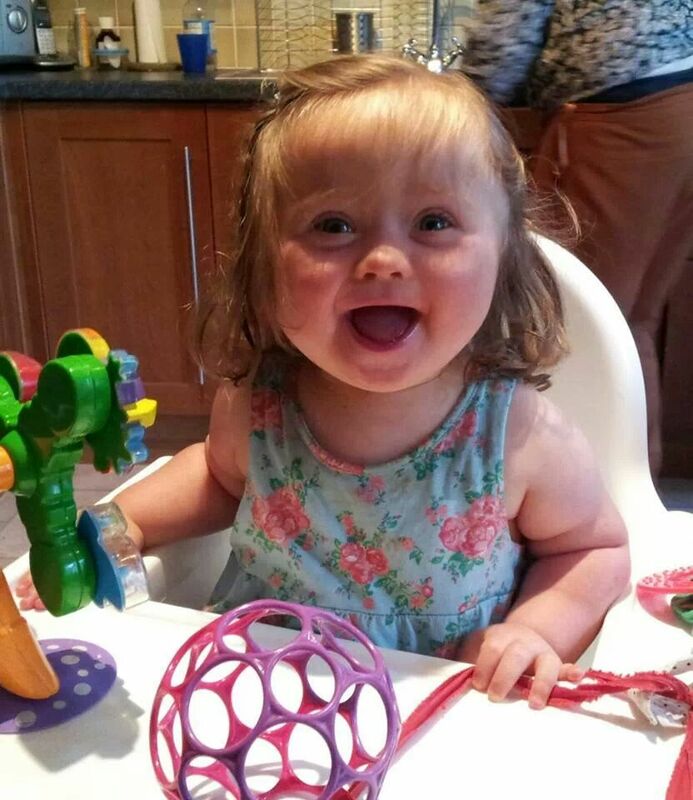 I have a daughter with Down syndrome.she is about 22months and she can take 10 to 15 steps without any help. I follow Noah and his family daily…THey are amazing..two parents who love their children..no matter what and thats all there is to it..they let Noah know that he can try anything and not to be afraid..Thats so wonderful..
Now to the person who treated the couple with DS so rudely..This person is either just a rude moron with no class..or his parents never taught him that you treat others the way you wish to be treated and should have shown them respect..Did you feel good embarrassing them? Because you are the one that looks like boo boo the fool now..
God Bless you all for each of us needs his love and guidance..Try being kinder in your hearts to those who aren’t..What if someone was mean or hurt someone you loved..Also something to think about..accidents happen all the time..suppose you went from the person you are now to someone who couldn’t walk, talk or basically do anything for yourself..or if you learn to talk again..the words come out hesitantly making you sound funny..Would you want to be ridiculed..So sad for you.. I AM the grandmother who is raising a DS 17 Month old boy with my daughter. He crawls at high speed,has 6 teeth, smiles and plays hand games. I’m just frustrated that he doesn’t want to walk alone. My oldest grandson says that he is spoiled! When will this little man walk? Comment please! This is a first for me. I’m 70. 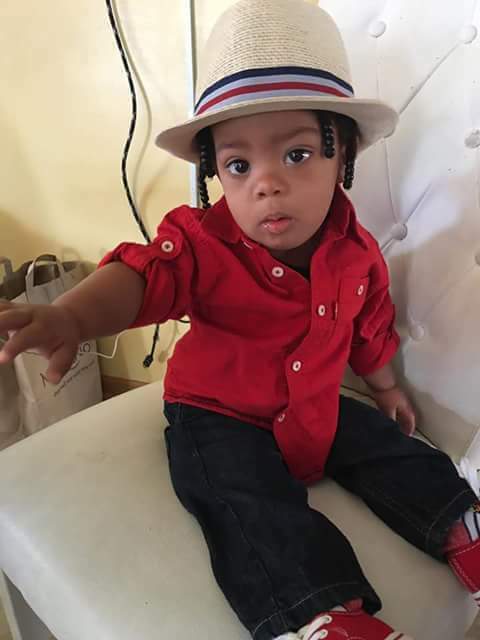 I ve a 17 months old that has refused to walk,or even crawl it’s only turning from one end of the bed to d other end….he is ds I guess but I just need assurance that he will walk..